Rejoice, blossoming cat-video producers: YouTube's new cloud-based tool will let you trim clips, stitch them together, add soundtrack music from a library of royalty-free tunes, and publish your kitty masterpieces—meowsterpieces?—directly to YouTube. 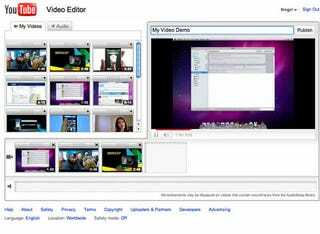 Even introductory video editing software like iMovie can seem daunting to someone who just wants to edit out a little pre-action handshake or combine a few graduation clips into one package. YouTube's new web-based editor lets you do just that (and little else). Still, the ability to intuitively arrange clips on a timeline, in-browser, seems like something a good deal of users should benefit from.